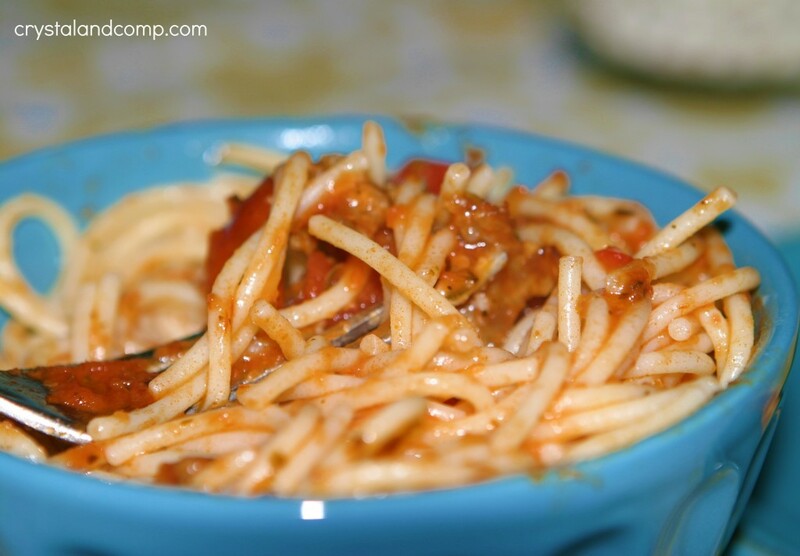 Spaghetti is an inexpensive meal and very easy to make. I love to make it in the crockpot. This recipe makes enough to have leftovers for another night of dinner or a very filling lunch later in the week. 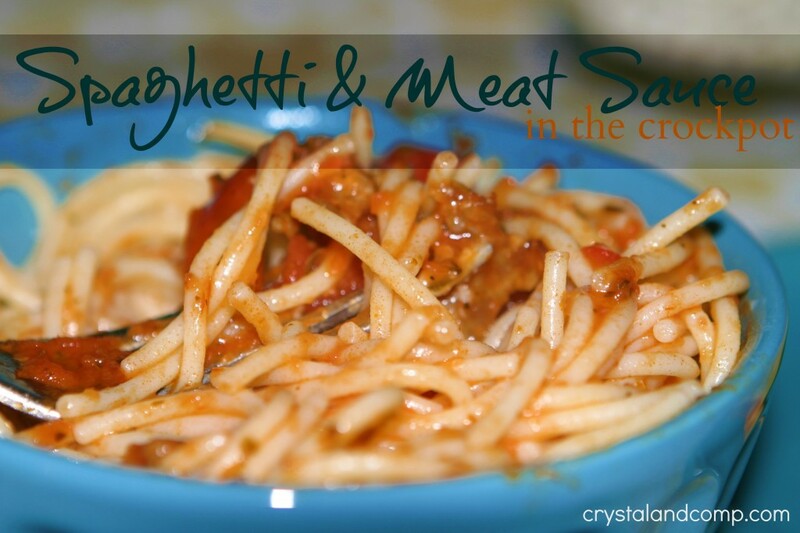 I do also have an easy Crockpot Spaghetti and Meatball recipe here on my site as well, but sometimes we are in the mood for meat sauce instead of meatballs. What about you guys? 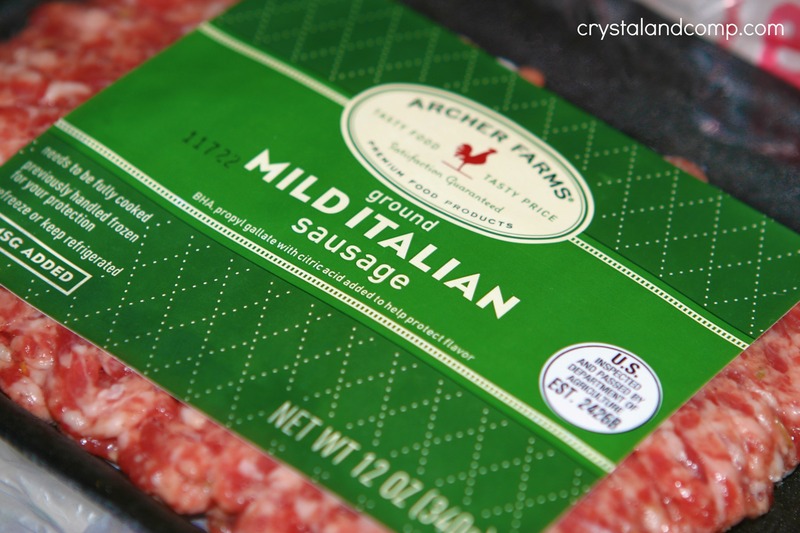 I purchase my Italian sausage already ground. It comes in different flavors, I generally get the mild. 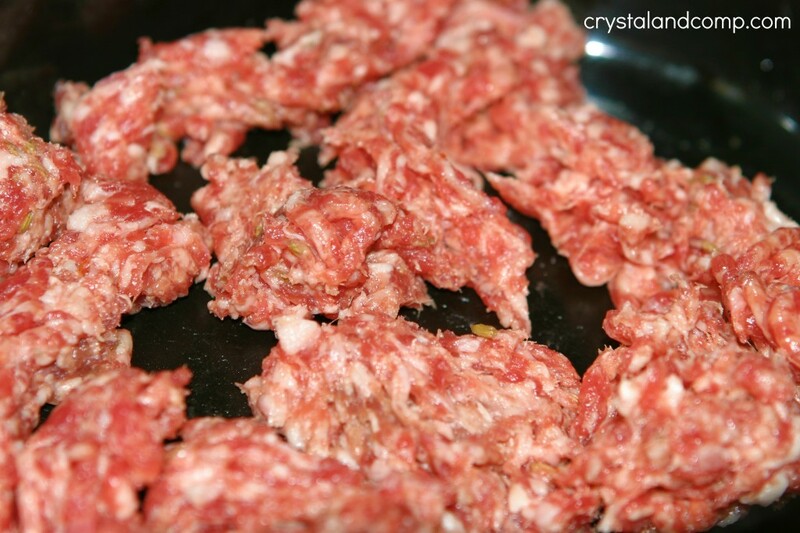 If you like your meat sauce really meaty, do two pounds of Italian sausage. Or a pound of this and a pound of hamburger meat. Use a spoon (or your hands) to crumble the meat up. Put the lid on it and cook on high for about 2 hours. 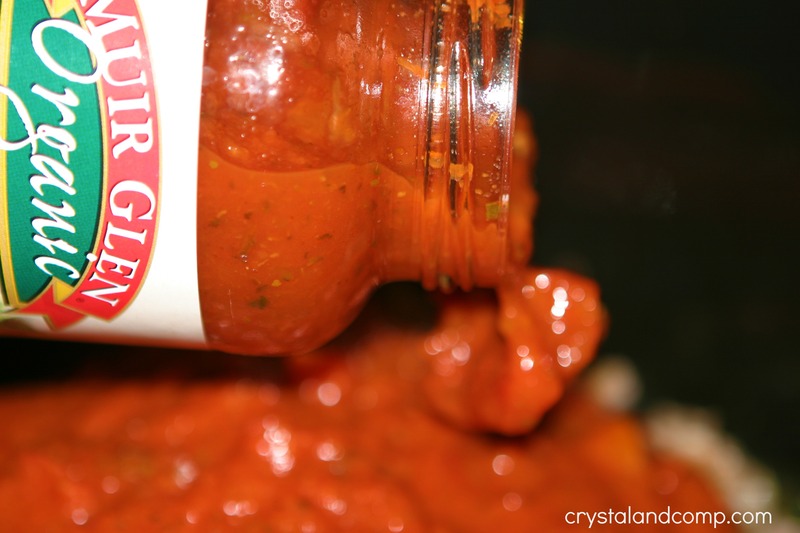 Once the meat is thoroughly cooked, add the two jars of spaghetti sauce. Stir well and pop the lid back on it. Cook on high for another 2-3 hours. See how steamy and hot it is when it’s done? Variation: you can add the crumbled meat (raw, obviously) and spaghetti sauce all at one time, but it needs to cook for a minimum of 6 hours on high or 8-10 hours on low. This would be the best option if you’re not going to be home during the day and you just need to dump it all in the crockpot at one time and head out the door. Ensure your crockpot can stay on the warm setting once the sauce has completed its cooking time. When your sauce has about 20 minutes left of cook time, or you’ve moved it to the warm setting, bring a large pot of water to a boil and cook the spaghetti noodles according to the box/bag directions. Serve the sauce over the noodles and top with a bit of cheese if you like. I also like to serve spaghetti with garlic bread. 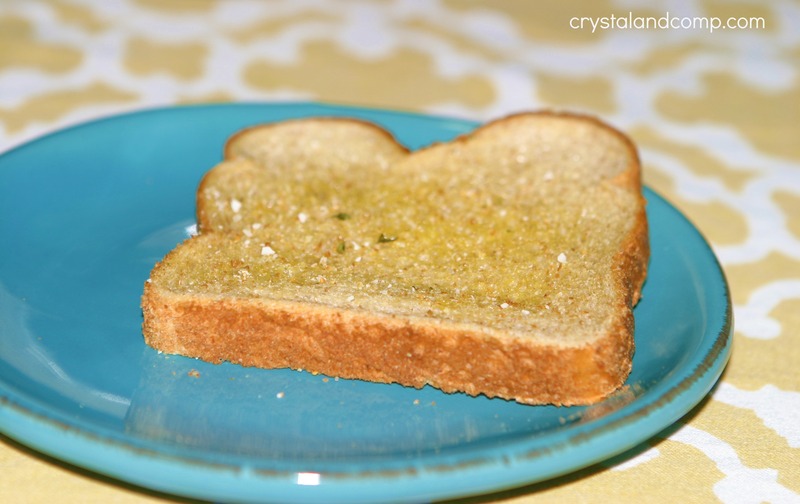 While my noodles are boiling I like to take regular sandwich bread (since we always have that on hand) spray butter on it and sprinkle with a bit of garlic salt. Pop it in a 350 degree oven for 12-15 minutes until toasty. 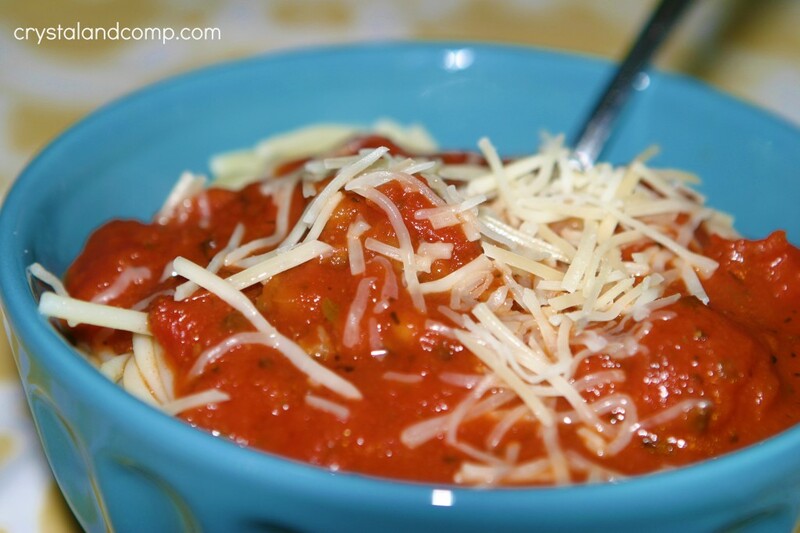 Spaghetti is an inexpensive meal and very easy to make. I love to make it in the crockpot. This recipe makes enough to have leftovers for another night of dinner or a very filling lunch later in the week. 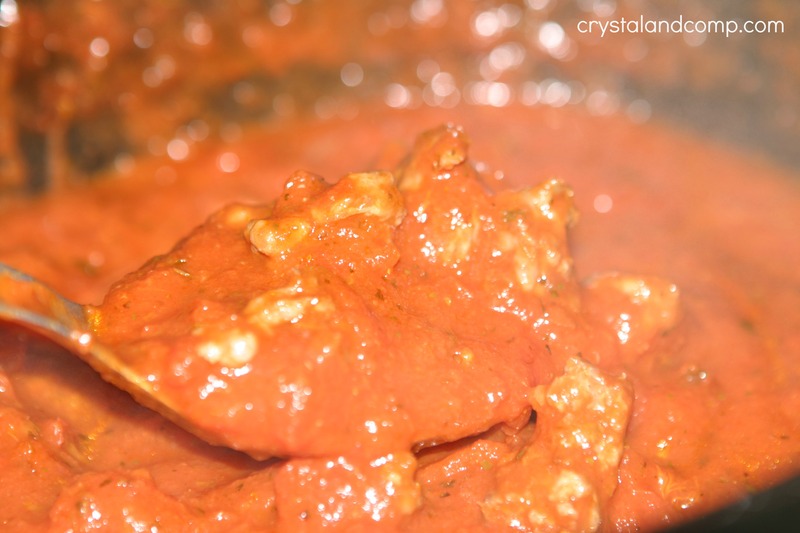 I do also have an easy Crockpot Spaghetti and Meatball recipe here on my site as well, but sometimes we are in the mood for meat sauce instead of meatballs. What about you guys? Add the meat to the crockpot. Use a spoon (or your hands) to crumble the meat up. Stir well and pop the lid back on it. Cook on high for another 2-3 hours. When your sauce has about 20 minutes left of cook time, or you've moved it to the warm setting, bring a large pot of water to a boil and cook the spaghetti noodles according to the box/bag directions. 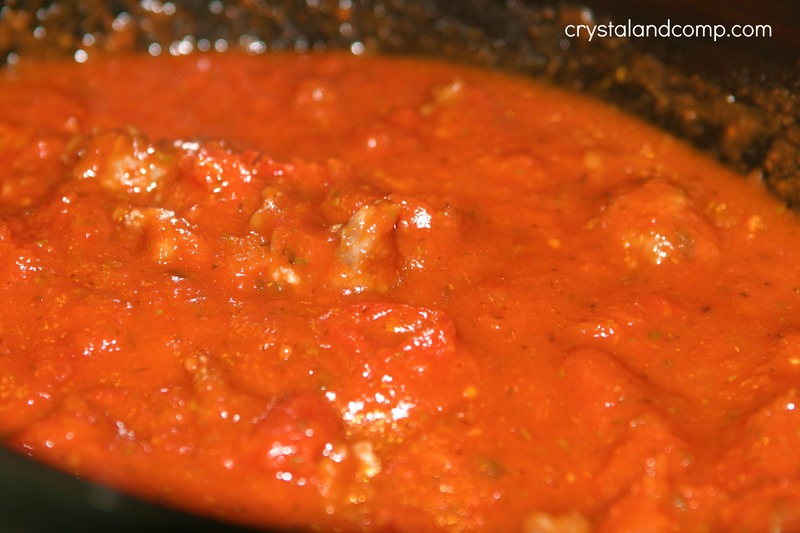 Variation: you can add the crumbled meat (raw, obviously) and spaghetti sauce all at one time, but it needs to cook for a minimum of 6 hours on high or 8-10 hours on low. This would be the best option if you're not going to be home during the day and you just need to dump it all in the crockpot at one time and head out the door. Ensure your crockpot can stay on the warm setting once the sauce has completed its cooking time. I also like to serve spaghetti with garlic bread. While my noodles are boiling I like to take regular sandwich bread (since we always have that on hand) spray butter on it and sprinkle with a bit of garlic salt. Pop it in a 350 degree oven for 12-15 minutes until toasty. Delish! Makes a lot, which is great because we love leftovers! Emily- right on. A perfect meal that makes lots of leftovers. Really i become very hungry to see these recipes. Thanks for your excellent job. We have spaghetti nearly weekly since it’s both affordable and delicious, but I’ve never tried doing it in the crockpot before. Who knew you could make spaghetti even easier?! 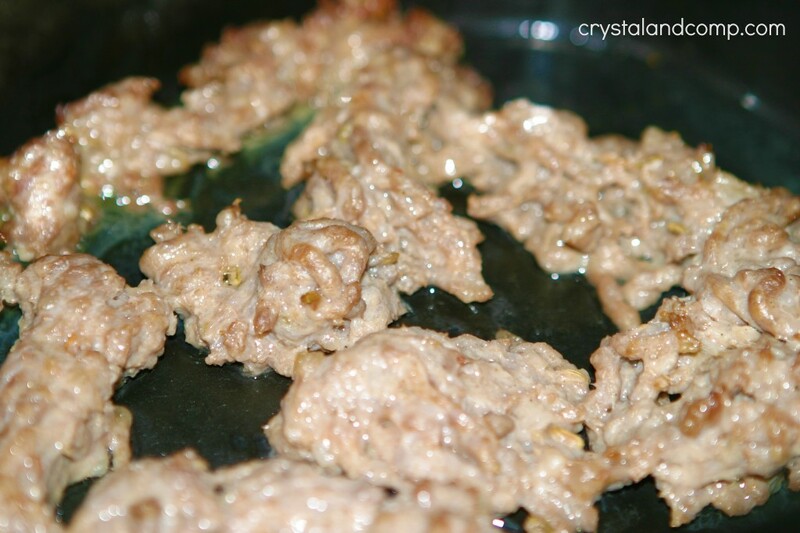 This is a very tasty and easy recipe, one that I love! Hope you are having a great weekend and thank you so much for sharing with Full Plate Thursday.